Tired of giving mom the usual gift of flowers, jewelry, or perfume? Why not give her the gift of cozy shoes! This Mother's Day, give mom the gift of style and comfort with the latest shoe styles from UGG Australia. For Mother's Day, UGG has a special offer you won't want to miss out on, that runs from now until May 8th. 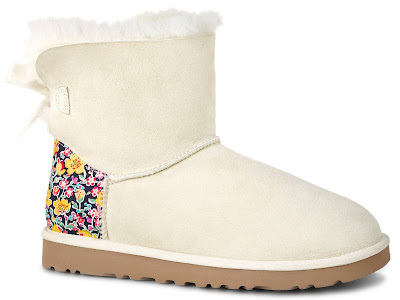 UGG is offering one-of-a-kind, limited edition Liberty London print from the 1930’s in some of their iconic styles like the Aira Slippers, Dakota Moccasins, and the Mini Bailey Bow Sheepskin Boot, along with a range of beautiful, luxuriously soft robes that are perfect for mom's pre-bubble bath or post-pedi relaxation. The Aira Liberty ($150.00) features a cozy natural wool interior and luxurious sheepskin collar; the Dakota Liberty ($125.00) features a plush natural wool interior, laces made from the bright 1930's Liberty print and a soft suede exterior; and the Mini Bailey Bow Sheepskin Boot ($200.00) features the bright floral Liberty print on the heel counter. What's even more amazing, for every robe or slipper purchase you make, UGG is giving away a delicious box of See’s Chocolate to make your gift to mom even sweeter. To take advantage of this great deal before time (and sizes) run out, visit www.ugg.com.